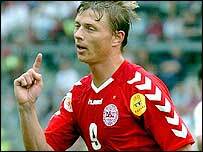 Jon Dahl Tomasson scored Denmark's first goal of Euro 2004 to ease them to victory against a dismal Bulgaria side who are now out of the competition. AC Milan striker Tomasson tapped home after a piercing Thomas Gravesen pass found Martin Jorgensen, who unselfishly squared for his team-mate to score. Jesper Gronkjaer joined the squad late because of the death of his mother and added a second with a controlled shot. Bulgaria were poor and Stilian Petrov was sent-off to compound their misery. Denmark dominated from the start and created the first chance of the game after five minutes when the pacy Dennis Rommedahl raced onto a ball down the left and looped a cross to the far post for Jorgensen. He took two touches to control and shoot but his effort was saved and Ebbe Sand also saw his follow-up shot blocked by Bulgaria keeper Zdravko Zdravkov. An out-swinging cross to the far post again had Bulgaria in trouble and Jorgensen was set to launch a header toward goal before left-back Ivailo Petkov crucially hooked the ball clear. Denmark carried on in the same manner as they did against Italy in the opening group game when they could not add the finishing touch to their possession and build-up play. They were dealt a blow when Rommedahl went off injured, but that signalled the arrival of the equally potent Gronkjaer, who missed the Italy game because of the death of his mother. Gravesen was the next Danish culprit to squander a chance when he could only strike a tame shot across the face of goal. Gronkjaer had received a vociferous welcome from the Danish fans and made an immediate impact on the game. He saw a low shot saved by Zdravkov before Sand headed wide from close range in a game where it was all one-way traffic towards the Bulgaria goal. Denmark's frustration was only growing and Tomasson rounding Zdravkov only to shoot into the side-netting did not help matters. Bulgaria were poor but almost delivered a sucker punch when Marian Hristov headed just wide after keeper Thomas Sorensen dropped a catch. A one-two between Hristov and Martin Petrov carved open the Danish defence but Petrov produced a weak shot straight at Sorensen. Denmark's pressure finally paid dividends when Gravesen threaded a first-time ball through Bulgaria's defence and Jorgensen squared for Tomasson to tap in. Bulgaria were now playing to stay in the tournament and, despite being more positive in the second half, there was little urgency about their play. Jankovic shot just wide in a rare Bulgaria attempt as they meekly went out of Euro 2004 which saw them lose 5-0 to Sweden in their first game. Denmark sat on their lead and, with the match at 1-0, gave Bulgaria a chance of snatching a undeserved equaliser. But Bulgaria's hopes fade when captain Petrov was red-carded for a second bookable offence after arguing over a free-kick which was not awarded. Gronkjaer shot home to complete an easy win for Denmark, who now face Sweden in their final Group C game. Bulgaria: Zdravkov, Ivanov (Lazarov 51), Kirilov, Stoyanov, Ivaylo Petkov (Zagorchich 40), Peev, Stilian Petrov, Hristov, Martin Petrov, Berbatov, Yankovich. Subs Not Used: Kolev, Ivankov, Kotev, Borimirov, Milen Petkov, Dimitrov, Chilikov, Manchev, Pazhin, Bojinov. Sent Off: Stilian Petrov (83). Booked: Kirilov, Stoyanov, Stilian Petrov, Zagorchich, Hristov, Martin Petrov. Denmark: Sorensen, Helveg, Laursen, Henriksen, Niclas Jensen, Gravesen, Tomasson, Daniel Jensen, Jorgensen (Claus Jensen 72), Sand, Rommedahl (Gronkjaer 23). Subs Not Used: Skov-Jensen, Andersen, Bogelund, Kahlenberg, Kroldrup, Poulsen, Priske, Perez, Madsen, Lovenkrands. Referee: Lucilio Cardoso Cortez Batista (Portugal). The yellow card Ebbe Sand received from referee Lucílio Batista in the 58th minute was the 500th in the history of the European Championship. The first ever player to be cautioned at the European Championships was Hungarian László Bálint in the Euro 1972 semi-final match against the Soviet Union. Thomas Helveg played his 86th international career match for Denmark. He has now drawn even with Jan Heintze and has earned a place in the top five of players with the most caps for Denmark. Peter Schmeichel is the most experienced Danish international with 129 caps. Stilian Petrov earned his 50th cap for Bulgaria. The Bulgarian captain made his debut on 23 December 1998 in a friendly defeat (4-1) against Morocco. It was not a very pleasant milestone as Petrov received two yellow cards and was the fifth player at Euro 2004 to be sent off. It was the 28th red card in the history of the European Championships. 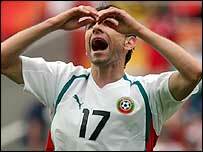 Bulgaria still have not scored a goal at Euro 2004. This means that Hristo Stoichkov remains the only Bulgarian player ever to have scored a goal at the European Championship.